April 9, 2018 | Use caution on the PRC, especially around the edges and streams of Lobster and Chesuncook Lakes, due to water flow increase from 430 CFS to 1433 CFS at Seboomook Dam by Brookfield Power. Weekly reports from Waterline FlowCast are available at www.h2oline.com OR click on the PRC Conditions page links below to view specific dam/water release site updates. Paddling is best between May and September. Fishing best on the "shoulder season" months. Recreational dam releases generally occur on Saturdays during July, August, and September. Reports are available from SafeWaters.com, the new and improved waterflow tool by Brookfield Renewable. Flow information can also be accessed by calling 1-844-430-FLOW, users will no longer need to provide a site code for conditions. To reach Seboomook and put-ins for the Upper West Branch trip from Greenville, take 20-mile Road north of Rockwood. Proceed tot he T-intersection (at South Seboomook Road) and turn left for the South Branch and Canada Falls (pay day use fee at the checkpoint) or turn right for Seboomook Campground and Seboomook Dam. Continue past Seboomook Dam to reach launch sites at Roll Dam. To reach Penobscot Farm and Lobster Stream, secure a North Maine Woods (NMW) pass to negotiate a NMW electronic checkpoint at the border of the Seboomook Public Lands (available at the 20-Mile checkpoint located across the South Branch.). Access to the Lower West Branch is off the Golden Road west of Millinocket. Call (207) 941-4014 for more information. 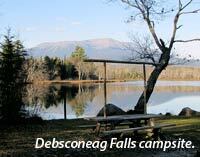 Park Manager Voicemail: (207) 592-1153. Below Roll Dam, the Upper West Branch offers a mix of quiet water and gentle quick water (typically a 3- to 4-day trip to Chesuncook Village). Class IV-V whitewater between Seboomook Dam and Roll Dam through much of the season (at water levels from 350 cfs up to 3,000+). Class IV-V whitewater below Canada Falls Lake provides 3.5 miles of challenging paddling, July through September, through weekly dam releases. Class III-V rapids in the Lower Penobscot River Corridor should only be run by guided whitewater rafts and experienced whitewater paddlers. See the AMC Canoe Guide to Maine and DeLorme's Volume 3: Northern Rivers canoeing guide for details. Plan your trip carefully and add extra days for unexpected weather when you may need to stay off the water. Suggested books: AMC Canoe Guide to Maine and DeLorme's Volume 3: Northern Rivers canoeing guide. Trailerable and hand-carry boat launches are highly variable. Use the online sortable boat launch listing and the PRC Information Packet to plan your trip.